Hey, did you hear the news about dogs coming from Asia? I don’t know about you, but I’m having a hankering for some dim sum and dou miao. 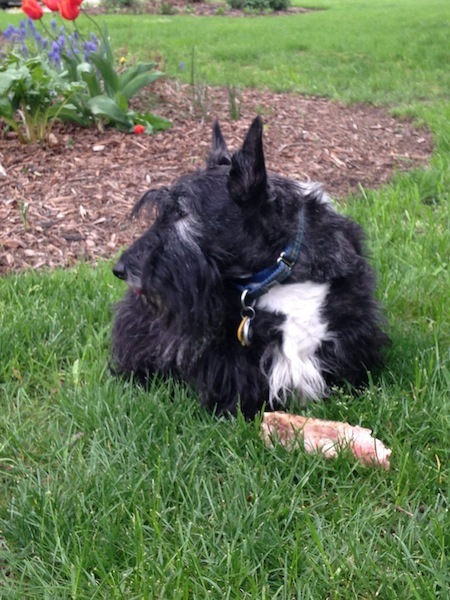 Actually, this beef bone is just fine. This entry was posted in The Scottie Chronicles and tagged canines, dogs, origins of dogs, Scotties, Terriers, where did dogs come from. Bookmark the permalink. 20 Responses to Shrimp Toast Anyone? You get beef bones?!!? Wow, you have good Peeps! Mom won’t let us have bones. It looks yummy. It was really good. It was a big porterhouse bone with no splinters. To tell you the truth, I gnawed on it for a while, then lost interest. Can you believe that? C’mon Stu, put some Sriracha sauce on it. I don’t think that dogs originated in Viet Nam. That stuff would burn me silly!!!!! We saw dat on TV. And my momma still didn’t share her Chinese food! Actually, as you and I know, I don’t believe it’s Asia. It’s Scotland. And that’s that. Frankly, I think it’s Scotland. Don’t you? …hmmmm that’s interesting… maybe that’s the reason that I’m a fan of spring rolls? btw: dou miao has nothing to do with kitties, right? BWAAAAAHAAAAAA! You made me spit out my breakfast. That’s funny! Mommy grows dou miao [must admit had to look it up and said – yes! snow peas…] and feeds us some right from the garden! Too bad we have to wait for next season for more. Hey, listen. If your peeps don’t already cook the snow pea leaves, then yap at them to do it. They’re YUM!! OOOOOHHHHH! Can I say spoiled????? You bet. That’s my middle name. And yours too my pal. We don’t think that the Scotties came from Asia. Well, dat explains why Riley loves beef chop suey! Tessie will only eat da beef! We prefers da bone like you gots der, Stu!